Any opportunity to catalogue my life, efforts and results is interesting to me. To be able to take the chaos of life reduce it to a graph or chart makes me feel good – I have it under control. So, this is bliss for me – I’ve been waiting to write this particular entry for weeks. It was 5 weeks ago that I decided that I needed to deal with my Shrunken Shorts Syndrome and my husband needed to look at his Ski Jump Shirt diagnosis. We committed ourselves to a month of exercise, healthy restricted calories and a 5K race at the end of it. I’ll admit, we cheated a bit – we started in the last week of March. We did consider having a binge instead, but we thought it would be too hard of a transition – and my pants were already too tight. It became a common sight to see me in workout clothes and weighting out food on our scale. 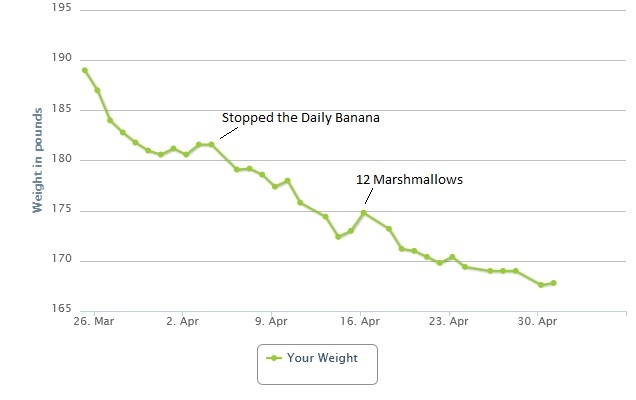 I had challenges – a bag of marshmallows disappeared quickly at a campfire one night (and even the raw ones on subsequent days). 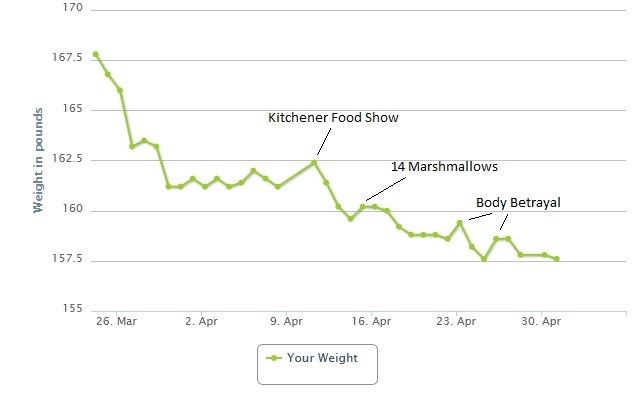 The Kitchener Food Show dessert samples slowed things. Emile faced and won numerous food challenges at work – functions with chef made cookies, pizza and butter tarts. There were days I just wanted to eat macaroni and cheese and be done with it. And sometimes we indulged, other times we held out. And we’re feeling pretty proud of ourselves. 3. Create an outside force – sign up for a class, a race, or target a wedding, or something to keep you focused for the short-term until your results are motivation enough. 5. Compete only with yourself. You’ll always find someone healthy, fitter, eating more wheatgrass, but who cares about them. This is about you!